Obviously, lightning struck the Eiffel Tower countless times, but each time the lightning rods are hit, and fortunately because otherwise the damage would be considerable, including human injuries. But as paratonnerrres have been arranged all around the summit there is no particular danger about it. Before seeing what is more in detail, let us quote the observation made on August 19th, 1889 of Mr Foussat, chief of electrical service of the tower. At about half-past nine in the evening, a very strong wind was blowing from the north-west, accompanied by a fine rain. Nothing made us suspect the presence of a storm, when suddenly an immense flash furrowed the clouds and struck with a terrible noise the lightning rod, which is at the top of the Tower, above the lighthouse; the metal tower sounded like a tuning fork, and the vibration lasted several seconds. At the time of the discharge, some droplets of molten iron fell, probably from the melting of the rod of the lightning rod, which momentarily was devoid of its tip. The noise of this disruptive discharge has imitated that of two small pieces of artillery fired at an invaluable interval, yet distinct from the ear. The lighthouse keeper felt no commotion, any more than the three people on the spotlight platform. In recent days, eight lightning rods had been installed around the spotlight platform; the end of these lightning conductors is constituted by a bundle of thin copper rods surmounted by a rod which advances a few centimeters in front of the beam. These lightning conductors have perfectly fulfilled their role; the clouds, by the way, were discharging, producing so-called silent discharges, but which, in reality, are crackling and recall the effect produced by a rapid short circuit, a well-known effect of the electricians. "The 300 m tower will be able to play the role of a huge lightning rod protecting a very large space around it, provided that its metal mass is in perfect communication with the aquifer of the basement by means of good drivers. Thanks to these precautions, the interior of the building, with the people who will be sheltered there, will be absolutely insured against any accident which can come from the frequent thunderbolts which will infallibly hit the walls of the Tower at different heights. To achieve the non-isolation of the Tower in the best conditions, we will drown in the aquifer layer of large section metal conductors, emerging from the ground and put in communication with the low metal parts of the Tower, by means of cables, bars or copper blades with large sections." Of course these recommendations were followed by the manufacturer, it was not necessary to play with security at that time. We will add only, from the point of view of lightning conductors, that the one who overcomes the campanile is of the Melsens system; it is terminated by three inclined tips 1.50 m long and has a total length of 10.79 m. In addition, eight deck-type lightning rods of the same type were placed on the upper deck balcony, two at a time. It was essential to make sure that the land was well suited to the purpose that had been proposed. A first determination of this resistance was made in January 1889 by Mr G. Borrel. The method employed was that of the Wheatstone Bridge, modified by Mr. E. Guerin, Captain of the Artillery Technical Section. The largest resistance found is 4.125 ohms (land in cell 3) and the least 1.05 ohms (land in cell 4). Since the maximum value of the resistance of a good lightning conductor earth is allowed at 15 ohms, it will be recognized that the most resistant earth is 3 and a half times smaller than the indicated limit, that is to say that these earth sockets are in the best conditions. As the Eiffel Tower was the first iron construction of such a large dimension in the vertical direction, and due to its shape, to be subject to considerable action by atmospheric electricity, it seemed worthwhile to check by precise measurements, the conditions of its own conductibility and its links with the earth. The Tower is currently equipped with nine lightning rods surmounted by a spike of points and connected directly to the iron frame which serves as a driver; it was thought that this frame, assembled by means of innumerable rivets placed in heat and joining the various parts with a very considerable pressure, would form a mass as conductive as if one had resorted to the usual welds. There are eight earth connections for ground connection, in groups of two for each pile; for the North and West piles, they are cast iron tubes, 20 cm in diameter, descending vertically, at about 12 m below the surface of the ground at the distance of 20 m: for the East and South piles, are large tubes 50 cm in diameter, descending vertically first, then curving at right angles over an average length of 18 m; they are buried in the alluvial deposits of the Seine, at 20 m. Provisionally, the loses-fluids are joined to the Tower by iron cables and strips of iron strap, applied on the frames. Conductivity measurements were used for the first time on a Wheatstone bridge, built by Mr Gaiffe to check the lightning rods at the stores and powder; the second time, we operated simultaneously with another device of the same manufacturer, equipped with a reflection galvanometer of the type Deprer and Arsonval, which allows a convenient use of the method of Mance. Determining the resistance of a grounding requires three experiments and two auxiliary grounding points, the sum of the resistors being measured in pairs. The three unknowns are given by three equations of the first degree. In this case, it was enough to combine the earthenware of the Tower itself in pairs. To measure the conductivity of the Tower, the target of transmitting the headlight and headlamps was first isolated from the aircraft and placed in communication with the base of the central lightning rod; The base of the cable was then connected to a West pile structure at the two terminals of the bridge, the Tower closing the circuit. The resistance, measured several times, was found to be equal to the degree of approximation of the devices, to the resistance of the targets that had been used for the connections. The resistance of the Tower is negligible. It seems that it may be concluded from these experiments, made two months apart, in various conditions as a method and as apparatus, that the concordance of the results obtained offers serious guarantees of accuracy. The Tower itself must be considered as a combination of frames perfectly in contact with each other, forming an invaluable resistance conductor; its bond with the soil, by means of eight loses-fluids and pipelines, is excellent, since the resistance has been found only of 0.1 Å; or 0.15 Ω at most for a single battery. The lost-fluids of the East and South pillars, which offer a very large surface buried in the alluvium of the Seine, have only very little resistance, 0.3 Ω as for the lost-fluids of the North and West pillars, if their resistance is stronger, 1,1 Ω and 3,2 Ω, it is undoubtedly because their surface is much smaller and that they cross concrete caissons forming the bases of the Tower. A series of observations on atmospheric electricity at the top of the Eiffel Tower was organized by the Central Meteorological Bureau, with the support of the Paris City Council. The potential is taken using the method indicated by Lord Kelvin, using a thin stream of water gushing from the end of a horizontal tube, to 1.60 m outside the Tower. The metal basin, constituting the water reservoir, rests on three glass tubes sealed in a layer of sulfur and embedded in a thick mass of paraffin. Thus done, the isolation thus obtained is at least equivalent to that given by the best sulfuric acid supports, but under this absolute condition that the surface of the paraffin remains clean of all dust. Very easily achievable at the altitude of 300 m, where the air contains only very little suspended solids, this condition is a serious obstacle to the use of paraffin for continuous observations near the ground. The whole is enclosed in an oak box and placed at the altitude of 285 m, on the end of one of the four arches (western arch) that support the lantern of the lighthouse. The photographic recorder is a Hichard cylinder, mounted horizontally and rotating inside a metal casing, in which a narrow slot is pierced along a generator. The photographic paper is wound on the cylinder, the sensitive face applied to the metal, so that it is the back of the sheet which is presented to the luminous impression. In the conditions we have just indicated, that is to say about 1.00 m from the surface of the Tower, the potential is frequently greater than 10 000 volts. Now, the quadrant electrometer, less in its ordinary form, does not appear to lend itself to the measurement of high potentials. The deflection of the needle to a limit value, variable with the sensitivity of the device, but still corresponding to the same value of potential which is about 3,000 volts. During a first series of experiments at the end of 1893, in order to stay within measurable potentials, it was necessary to reduce the length of the outlet tube to 40 cm. But, at this altitude, the level surfins are extremely tight in the vicinity of the Tower; the slightest variations in the length of the jet (resulting from the action of the wind for example) correspond to considerable variations in the observed potential and the curves obtained are too tormented to be able to be stripped with certainty. In the absence of an instrument which does not seem to have been realized so far in a form suitable for observations of atmospheric electricity, we have been able, by a very simple device, to use the quadrant electrometer for the measurement of very high potential, while staying within the ordinary limits of the sensitivity of this device. To do this, it is sufficient to place, between the source and the electrometer, a cascade of small capacitors well insulated. By varying the number of elements in the cascade, we can give the needle such a fraction as we want of the primitive potential. The observations made by this method in 1893 were continued without interruption from May 1st to November 2nd, and form two series. The first, which runs from May 1 to August 20, has provided us with fifty-eight usable days, typical of the summer diet. We give here the summary, in graphic form, and we add the diurnal variation observed during the same period at the Central Meteorological Bureau. From the comparison of these curves, it follows firstly that for atmospheric electricity, as for the tension of water vapor, the diurnal variation is simplified when one moves away from the ground. While at low altitudes there is invariably a double oscillation in the value of the potential, it only has a maximum and a minimum near the top of the Eiffel Tower. The morning minimum occurs at exactly the same time (4 hours) at the Tower and the Office; it precedes very little the time of the average sunrise during the period considered. The evening maximum, at the Tower, takes place at 6:30; it is 1h15 ahead of the maximum observed near the ground. Finally, the two curves clearly show the existence of a relative maximum in the middle of the day, around 1 o'clock or 2 o'clock in the afternoon. 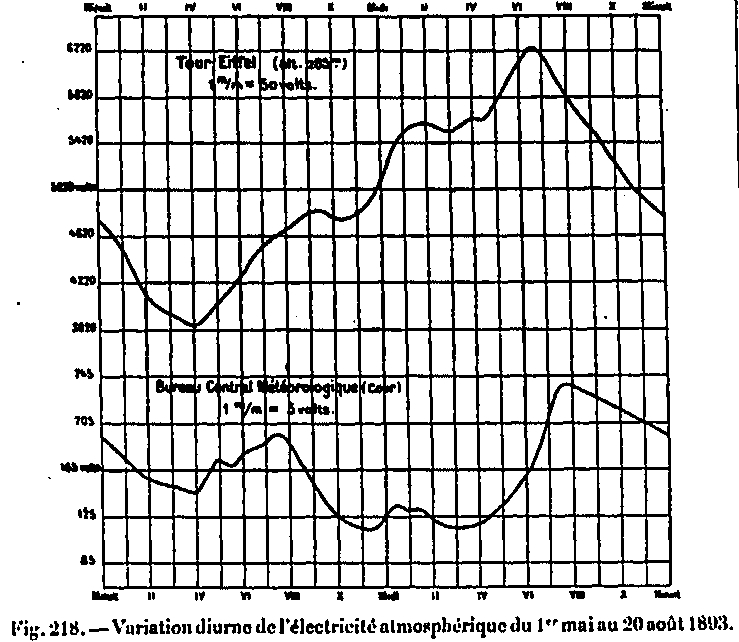 This secondary oscillation, previously reported by Mr Mascart in the observations of the College de France, found in Greenwich and Perpignan, was not found in Lyon. It seems beyond doubt, whatever the altitude for the climate of Paris. These observations, continued for eight years, now form a series so extensive that the data which are deduced therefrom are of sufficient accuracy. I indicate here the results of this research, relating to the diurnal variation of the potential at a given point of the atmosphere. In our temperate regions, there are two very different types of diurnal variation in the vicinity of the soil, one being your hot season and the other in the cold season. During the summer, a very high minimum occurs during the hot hours of the day and is the main minimum whenever the point explored is not sufficiently clear of the influence of soil, trees or neighboring buildings. The diurnal oscillation is double; it is the generally accepted law for this variation. During the winter, the afternoon minimum subsides or disappears, while the night minimum increases further. Considered as a whole, the oscillation seems simple, with a maximum of day and a minimum around 4 o'clock in the morning. This character is all the clearer as the place of observation is clearer. This distinction of the two winter and summer regimes in the vicinity of the ground is confirmed by the examination of the results obtained, on the one hand in Sodankyla (Finland) by the mission led by Mr Lemstrom (1883-1881) on the other, at the observatory at Batavia (1887-1895). Each of these stations gives, so to speak, the exaggerated type of variation observed in our climate, either during the cold season or during the hot season. The diurnal variation at the top of the Eiffel Tower during the summer, entirely different from the corresponding variation at the central office, offers the most striking analogy with the winter variation. This same type of winter is found, less accentuated, but perfectly clear, in the average provided by three months of observations, during the summer of 1898, on the pilothouse of the observatory of Trappes (attitude 20m). It therefore appears to characterize the constant form of diurnal variation outside of any influence of the soil. On the contrary, in stations where the collector is dominated by neighboring buildings or trees, the type corresponding to the summer diet is exaggerated; the minimum of the afternoon widens to the detriment of the night minimum, which at times disappears. The oscillation can be simple, but in the opposite direction of the winter oscillation, that is to say with a minimum of day and a maximum of night. This abnormal form of the diurnal variation, observed previously by Mr Mascart, results indeed from the observations of the College de France, but for the summer season only. It is still found, almost identical, in Greenwich, where the collector is placed in such unfavorable conditions. That the true law of this variation, which any theory, to be acceptable, must account for, results in a simple oscillation, with a maximum of day and a minimum (moreover remarkably constant) between 1 hour and 5 o'clock in the morning.